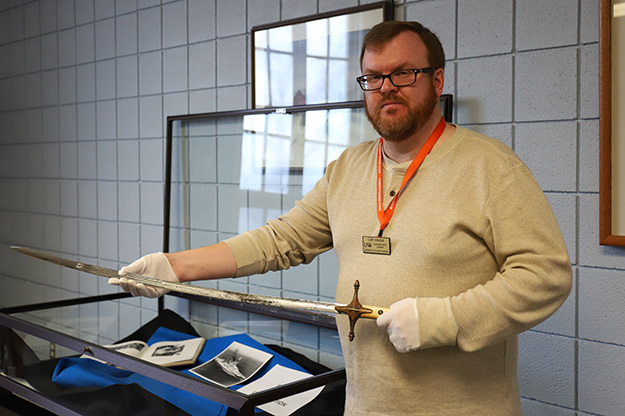 Curt Hanson of the Elwyn B. Robinson Department of Special Collections holds the sword of 2nd Lt. Carleton Elliott Simensen, the first UND graduate killed during WWII. The department’s North Dakota military heritage collection already bears Simensen’s name — honoring his sacrifice. Photo by Connor Murphy/UND Today. 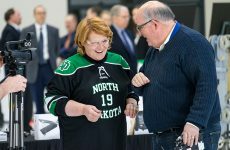 At long last, a piece of UND history has found its way home. The ceremonial sword of Marine 2nd Lt. Carleton Elliott Simensen recently arrived at the University as a donation from a West Coast collector. Even before the sword’s arrival, Simensen’s name and legend, as the first UND graduate killed in World War II, already had been part of the military heritage collection of the Elwyn B. Robinson Department of Special Collections in the Chester Fritz Library. The collection documents North Dakota service in war from the Civil War to the present. 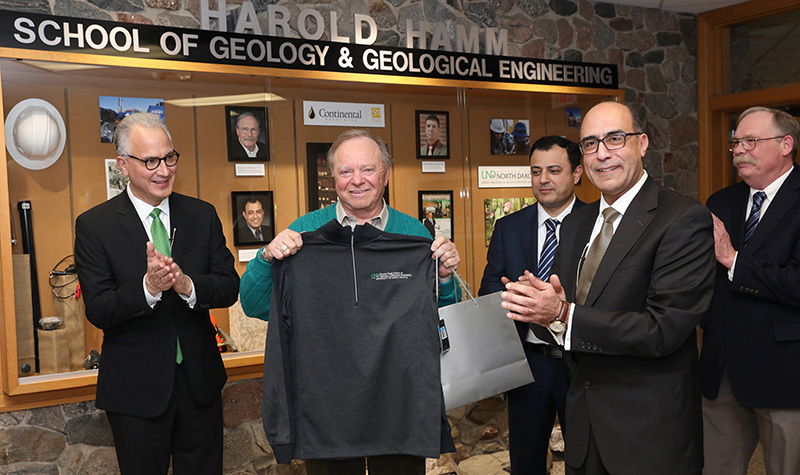 “When I got the email, it completely knocked my socks off,” said department head Curt Hanson, who’s been with Special Collections for 18 years. As a World War II history enthusiast, his excitement was tough to contain. Though it’s tough to spot, Simensen’s name is legible through the damage sustained by the sword. Sia Rezvani of Portland, Ore., discovered the Marine’s connection to UND after purchasing the sword on Craigslist. Photo by Connor Murphy/UND Today. The email came from an attorney in Portland, Ore., who found the sword on Craigslist, of all places. Sia Rezvani is a sword aficionado and practices historical European martial arts in his free time. Once he got home and began cleaning it, he started to notice the nameplate closer to its hilt. Rezvani could just barely make out the letters inscribed on the blade. He took to Google for a lead. When you type “Carleton Elliott Simensen” into Google, the UND collection of his namesake is the first result. This led Rezvani to contact the Chester Fritz Library, as the sword’s seller wasn’t aware of its history. Marine 2nd Lt. Carleton Elliott Simensen in uniform. Image courtesy of the Elwyn B. Robinson Department of Special Collections. Hanson described it as a moment that was almost too good to be true. 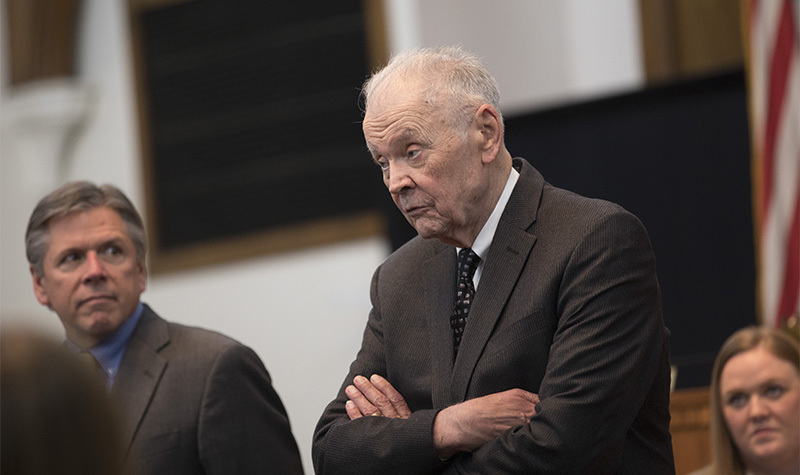 “To receive the Simensen sword, given how much I’ve researched World War II and my grandpa’s service, was just truly amazing,” he said, drawing comparisons between his grandfather, who crawled up Omaha Beach on D-Day, and Simensen, who died at Pearl Harbor. Simensen came to UND from Grandin, N.D., where he studied business and became a member of the Reserve Officers’ Training Corps. 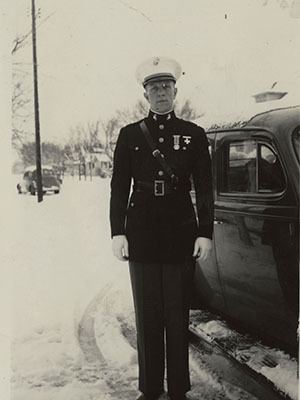 Upon graduating from the UND School of Commerce in 1940, Simensen also received the rank of second lieutenant and his commission into the U.S. Marine Corps. He served as a recruiter for the Marines until he transferred to the U.S.S. Arizona at Pearl Harbor, Hawaii. On Dec. 7, 1941, the Japanese launched a surprise attack on the United States naval base. By Hanson’s telling, Simensen woke and immediately rallied his men to defend the ship. They had to make their way to the main decks in order to fight back. As he ascended a ladder ahead of the rest, he was mortally wounded by enemy bombardment. In his dying moments, he rejected medical attention, instead urging his men to press forward. The U.S.S. Arizona can still be seen today at the bottom of the harbor. 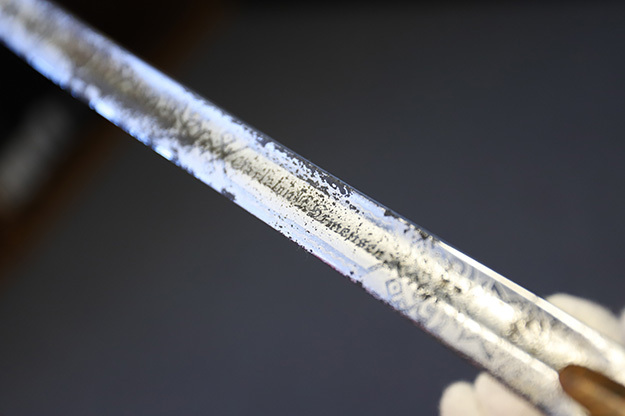 Simensen’s sword now rests on the fourth floor of the Chester Fritz Library. Soon to be completed, the display shows images of Simensen in uniform, the U.S.S. Arizona and the telegram sent to Simensen’s parents upon his death at Pearl Harbor. The Mameluke-style sword remains the ceremonial sidearm of the U.S. Marine Corps. Photo by Connor Murphy/UND Today. Eventually, Simensen’s dress sword went to his brother, Kenneth. The younger Simensen served in the Air Force during World War II as well as in Korea and Vietnam. When Maj. Kenneth Simensen retired to Oregon, the sword stayed with him until his passing in 2003. Rezvani purchased the sword from the family in 2017 for $50. 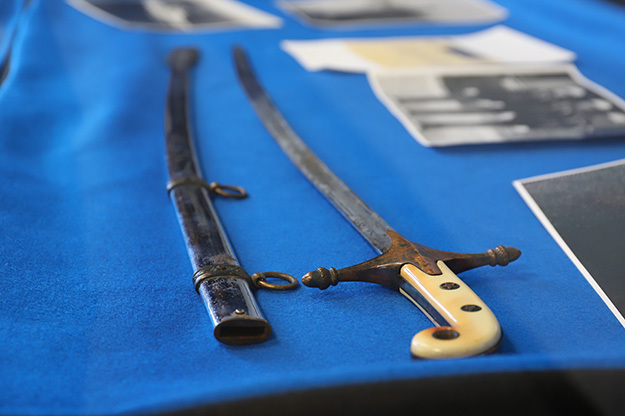 Still in use by the Marine Corps to this day, the sword is Mameluke style – cross-hilted and curved. By the time it came into Rezvani’s possession, it bore the wear and tear of exposure. Now in the hands of UND Special Collections, it will display in its own case on the fourth floor of the Chester Fritz Library. As a World War II relic, it will share space with North Dakota’s 164th Infantry Regiment – the first U.S. Army unit to engage in offensive action in World War II. The department serves as the regiment’s official archive. Even if only a few people come to see the sword, it’s all worth it to Hanson.